Amplify your tunes without plugging in your phone thanks to this wire-free speaker. No adaptors. No bluetooth pairing. No frustration. Just music. Simply lay your phone on top of this stylish portable speaker and thanks to technology, the tunes will play loud and proud. 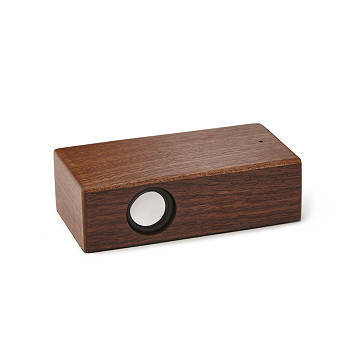 Switch phones and playlists easily at a party, and doubly impress your guests thanks to the speaker's smooth wooden look. It'll keep the jams flowing for 6-8 hours once it's charged up via USB—or in other words, it can totally hang. Made in China. Charge via USB for a 6-8 hour battery life. USB included.